We have a problem, Fort Mac. In some places it would be called voter apathy, but here, where our turnout for elections is always shockingly low, it has sunk lower than apathy. It seems to sit somewhere around antipathy instead, a situation where people actually disdain voting and shun the democratic process. This saddens me as voting is one of the main ways we control our own destiny. Voting is dependent on one major factor, though - engagement. 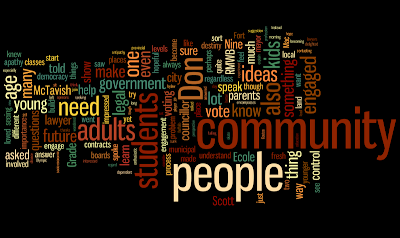 In order for people to want to vote they need to feel engaged with the community. This can be very tough to accomplish with adults who have an ingrained habit to not vote, or who don't feel engaged - but there is a way to combat it. This is to engage people when they are young, before they can legally vote, and involve them in the community. This strategy of early engagement tends to lead to stronger community ties - and to an increased interest in participating in democracy. For this reason I am always very interested in seeing students, especially younger adults, learn about democracy. Thus when local lawyer and RMWB councillor Don Scott invited me to join him when he went to speak to some Grade Nine classes at Ecole McTavish I leapt at the chance. He'd been asked to speak to them about matters both legal and political, and I was quite anxious to hear what the students had to say. And people - they didn't disappoint me in any regard. I must admit I wasn't sure how things would go. Being a lawyer and a councillor isn't quite like being an Olympic star or NHL player, and I wondered if the kids would be impressed. The thing I noticed, though, is that Don has such a sincere and genuine manner that it wasn't long before the kids were listening to him very attentively. Don spoke to them about how getting involved in the community is something everyone can do, regardless of age. He told them about how many of the boards of different groups in town have places specifically for young adults like them, and about how they are needed to provide their perspective. He told them that the RMWB recently passed a bylaw allowing people under the age of 18 to serve on municipal boards, and that this is one way to start becoming involved. And then he told them how any of them could become a councillor one day, or the mayor, or the prime minister - and, of course, it's true. The kids had a lot of questions, too. They had legal questions, a lot of "what if" scenarios that Don answered thoughtfully, admitting when he didn't know the answer (and people, I have MAD respect for that). They also had ideas about how to improve the city - things that would make the city a better place for them. Several of the kids suggested a new skate park in Wood Buffalo since the closest one is in Timberlea. I loved how they presented their case, starting with "well, if you really want to keep us off the streets..." - because it showed that they know how to build an argument. I also loved that as soon as those students left the classroom to head to their next class Don was on his cell, sending a message to our mayor and the rest of council, telling them of the suggestion. That's the sort of thing that builds faith in our youth, people - "res, non verba", which means actions, not words. Don also helped the students understand the different levels of government, what they do, and what they can - and cannot - control. This is something that puzzles even adults. When people complain about highway 63 to the municipal government the local government can listen to the concerns and pass them along, but they don't control provincial roads. None of the levels of government can force a Costco to open here in Fort Mac, but they can try to make sure we have the land to build such developments, and that we make the RMWB a welcoming place for them to set up shop. Don also addressed some legal topics. I suspect a lot of students went home and asked their parents how they know they own their house (and I'm hoping all the parents knew the answer to that, too). He spoke about land titles and contracts (and about the importance of reading contracts prior to signing them, something which many adults are guilty of failing to do). He also talked about how young adults should consider contacting a lawyer when they are seeking help for a problem. As he said many know they can speak to their parents, their teachers, or the police - but few would realize that they can also reach out to someone in the legal profession for assistance, and that most lawyers will try to find a way to help (honestly even I had never thought of this, so I got some education, too). There were several moments that impressed me. Some of the students knew what the MDP is (the Municipal Development Plan which I have written about) - a plan that I've had to explain to adult residents of our community. They asked questions that were intelligent and thoughtful. They expressed opinions, and they had ideas. And that's perhaps what I love the most, people. The ideas at this age are not yet saddled with the burden of skepticism. Instead of seeing the "why we can't" do something they ask "why can't we"? It's those fresh ideas, and those fresh minds, that can contribute so very much - which is why we need to engage these young adults in our community. We need to help them to see that they are not only a part of our city but that they are our future. We need to show them their importance in the process, and make sure they understand that their ideas and thoughts are valued. We need to show them that they matter even if they cannot yet vote (or even drive). We need to show them that community isn't just about people over the age of 18 but rather encompasses all of us, regardless of age or gender or culture or socio-economic status. And that's why I was so delighted to spend my morning with Councillor Don Scott, a fantastic Ecole McTavish teacher (who is engaged, enthusiastic, and encouraging), and two classes of Grade Nine students. I saw future leaders in our community, and they made me hopeful. They made me hopeful for their future, and for the future of this community. I saw them start to become engaged in the community, and in guiding their own destiny here. It was an incredible thing to witness, and frankly I hope to see a whole lot more of it, too. I think many of the people in our community who reject both voting and community involvement might just be able to learn a thing or two from some much younger, but perhaps much wiser, citizens. 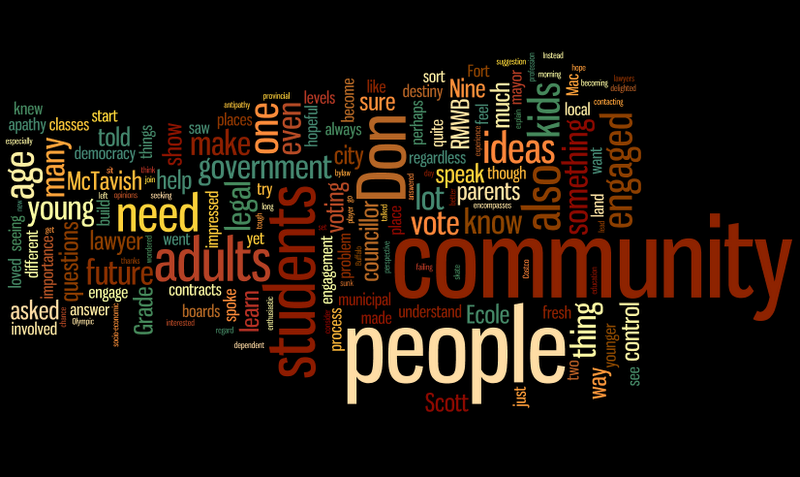 Take a lesson from some Grade Nine kids, people - and get engaged. this sort of experience to learn about democracy!